where can I find experimental compressibility factor values? I am interested in experimental compressibility factors for various gases, such as methane and carbon monoxide. Not only for standard pressures and room temperature, but in a range from 1 to a few 1000 bars and various temperatures. Where can I get them? I've done a quick google search, but they seem to be well hidden. EDIT: Perhaps a better question is where can I find second, third, fourth, fifth... virial coefficient for these 2 gases? I am interested at 2 temperatures: 200 K and 287 K. I found some so far, but not at 287 K.
The NIST Reference Fluid Thermodynamic and Transport Properties Database (REFPROP) is a program that can calculate the thermodynamic and transport properties of some important fluids and their mixtures. It was developed by the National Institute of Standards and Technology (NIST) and is commercially available as NIST Standard Reference Database 23 here. For example, the following selected results have been obtained with REFPROP Version 9.0. The number of digits is set to the default value (5 digits), which are not necessarily significant. Not the answer you're looking for? Browse other questions tagged experimental-chemistry gas-laws reference-request databases or ask your own question. Where can I find a downloadable spreadsheet of element properties? Where can I find CAD blocks for lab glassware? How/where can I find a reliable atomic radii table? Where can I find a downloadable database of basic physical and chemical properties? Where can I find ranges of isotope abundances? 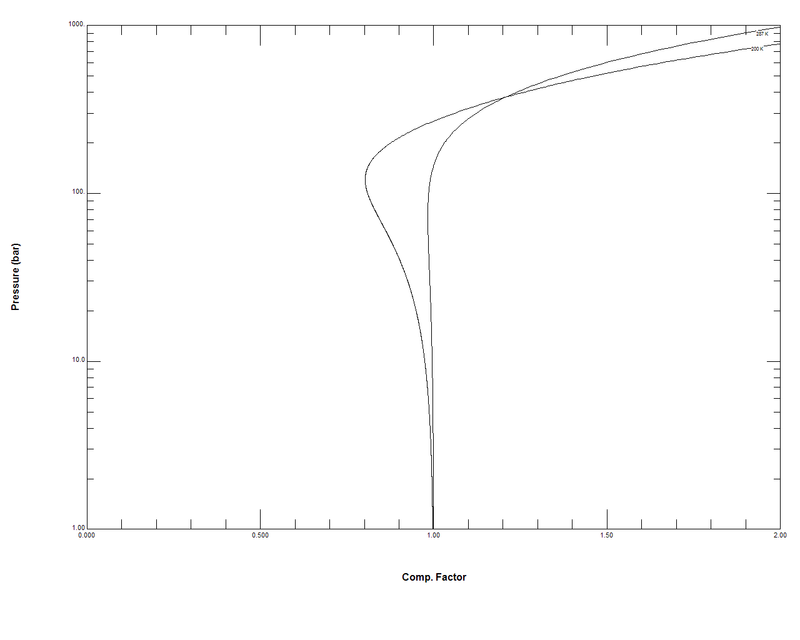 Compressibility Factor Graph - Which gas attains a deeper minimum?